Today we have a heartwarming story of a forgotten heroine of World War 2 which carries with it a South African twist. 1941: Betty Quinn, 17, the youngest recipient of the George Medal, at the Investiture Ceremony at Buckingham Palace, London. She saved seven people from a bombed air raid shelter while serving as an ARP Warden in Coventry during WW2. 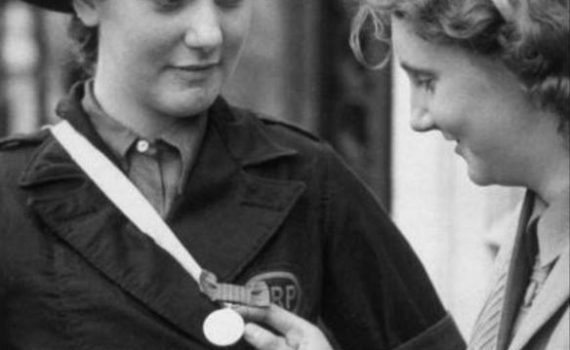 Betty Quinn, a St. John Ambulance cadet, was awarded the George Medal for her bravery on 14 November 1940 during the heaviest night of the Coventry Blitz. She was giving first aid at an ARP post when a shower of incendiary bombs fell in the district: “Without waiting for assistance she ran outside. AA batteries were putting up a heavy barrage and shrapnel was falling all round. Bombs began to fall and a man was injured by one. Miss Quinn assisted him to a private shelter. Betty Quinn was tracked down in 2005 for an invite to attend the unveiling of the Women of WW2 Memorial, next to the Cenotaph in Whitehall, London. Betty was living in Cape Town, South Africa where she had been living for 63 years, a direct result of what happened in 1940. Following her fame which spread throughout the Empire after her award, she received a marriage proposal from a South African, which was obviously too good to refuse.